On a semi-recent cold Winter morning, Baby Chino and myself set out for a brisk (but shamefully short) bike ride to Small Block, an unassuming cafe-front at the cool end (my end) of Lygon Street, where we were meeting the indomitable Ms Sourdough and the ever-elusive Doctor Dessert for breakfast. Small Block plays heavily on a simple maths theme. For those of you who quiver at the site of the quadratic equation, or simply get angry with algebra – this is a safe place. There is a number wall with single digits pleasingly arranged in a tetris-like collage; there is a giant happy-coloured abacus adorning another wall and there are games aplenty for those so inclined to play as they eat. As there would be nothing like a good board-tipping followed by a huffy walkout to spoil a morning out, I refrain from playing games in public so this feature is lost on me. The decor was very sparse and basic, with concrete floors and functional ugly-but-comfy chairs – just what you would expect from a left-brained establishment. What a neat pile of muesli. 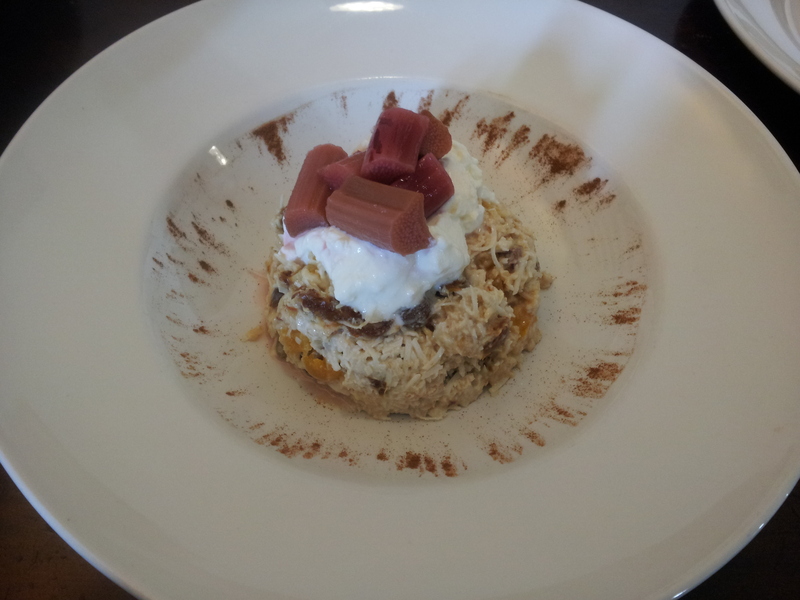 I enjoyed the rays of cinnamon framing the meal like a halo, an appropriate presentation for the glory that is cereal. Speaking of wonderful things, I would have to say the best thing about Winter is rhubarb. I will never stop being pleased to see it and today was no exception – such volume of chunks! The praise, however, does not continue much beyond this superficial level. The Small Block muesli was very light on the oats and heavy on the coconut, resulting in the dish tasting very much like a rhubarb crumble. Now, I am all for breakfast-dessert, but here I was expecting a breakfast-breakfast and so was not loving this dessert-dessert masquerading as muesli. It was all very sweet and crumbly, with sultanas and possibly dates providing some enjoyable chewiness – which is all well and good except I would soon have no teeth to chew with if I continued to eat breakfast with the sort of sugar content that the Small Block muesli seemed to have. Final Word: If you are not a diabetic (or prepared to increase your insulin dose if you are) and feeling like some yoghurty rhubarb-crumble for breakfast, try the Small Block Muesli. If you value your teeth and pancreas perhaps stick to the eggs. My latest breakfast outing saw me venture out by the Hurstbridge Line to visit the new stomping grounds of the lovely Madame Macchiato, in the suburb of Fairfield which is known for its boathouse and proximity to Northcote. I do not mean to suggest with my allusion to the rail that I took the train, as I make a concerted effort to avoid public transport at all costs in preference to the power generated by my lower limbs or – at a similar horsepower – by a borrowed, third-hand Citroen. This is in equal parts due to my being a bit of a cheapskate (this is a muesli and not a ‘big breakfast’ blog after all) and seeming to always have to travel in an East-West direction which is the domain of the cumbersome and unreliable bus service. I seem to be griping about infrastructure lately, I’ll try not to lose sight of what matters here: oats. Upon arriving at Fifteen Pounds I was immediately struck by how untreated it seemed. The crisp pre-9am sunlight was streaming in through the front window adding a golden glow to the pale timber furnishings. These tables and chairs are of a naturalistic, not obviously varnished style as if they have been simply hammered together freshly hewn. The place has a raw, earthy feel to it which is enhanced by a hanging feature of a tree branch suspending birds alighting on jars, a surreal piece that looks good but on reflection does not make a lick of sense! Perhaps a comment on how close all things in nature are to becoming jam? A sobering thought. Another piece of decor I quite enjoyed was a prominent water tank that contained brightly coloured citrus fruit floating enticingly within. The bright yellow and green made the water seem so clean and inviting – it is this sort of a contraption that could turn children off soft drink and help end the obesity epidemic – or at least that is how optimistic I felt looking at it. 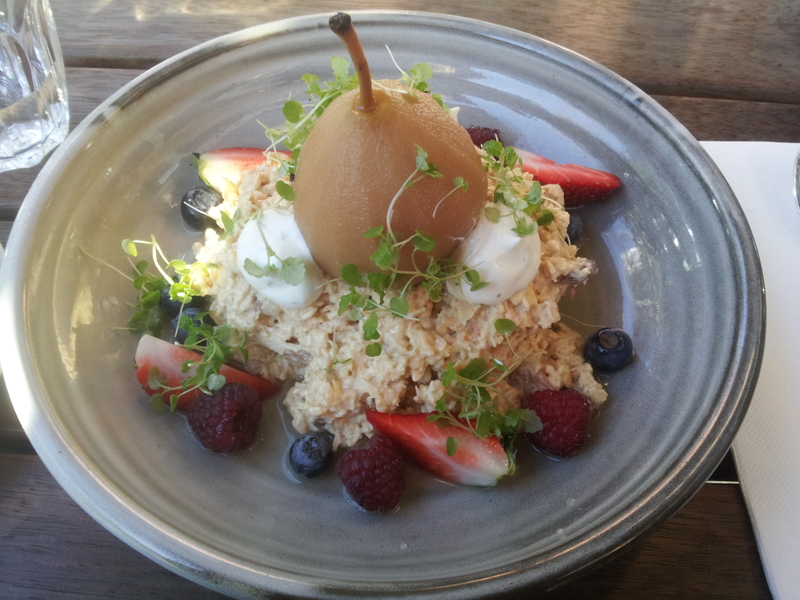 Thats: House Made Bircher w/ apples, carrots, fresh juice, organic yoghurt & berries for those with a cynical eye. Instant disappointment! The last thing this hungry Miss wants when she orders breakfast is for it to be served in a quantity able to be artfully arranged in a drinking glass. The first port of call was how to fit the spoon in without creating an Archimedes-in-the-bath type situation – it took uncharacteristic finesse but the incentive of eating generally drives me to complete great feats and so I managed. What I found was a very sweet muesli which was in part due to the overbearing volume of berries and also to the oats having been soaked with juice instead of the usual milk. The juicy taste did trick me into feeling refreshed so that was nice. Upon closer examination I was able to note streaks of orange buried in the mass of yoghurt and berries and I subsequently enjoyed the earthiness that the carrots contributed to the meal. Carrot is such a versatile vegetable – well done, evolution! Despite this foray into root vegetables, Fifteen Pounds did not excite me with this muesli. Berries and sugar stole the show in the end which unfortunately left me feeling unsatisfied, but fortunately prompted me to buy a muffin for the road – which was delicious. Final word: Do not order the muesli at Fifteen Pounds if you are hungry or are offended by the idea of breakfast in drinking glasses. The cafe is, however, worth a visit if not only to marvel at the water dispenser. 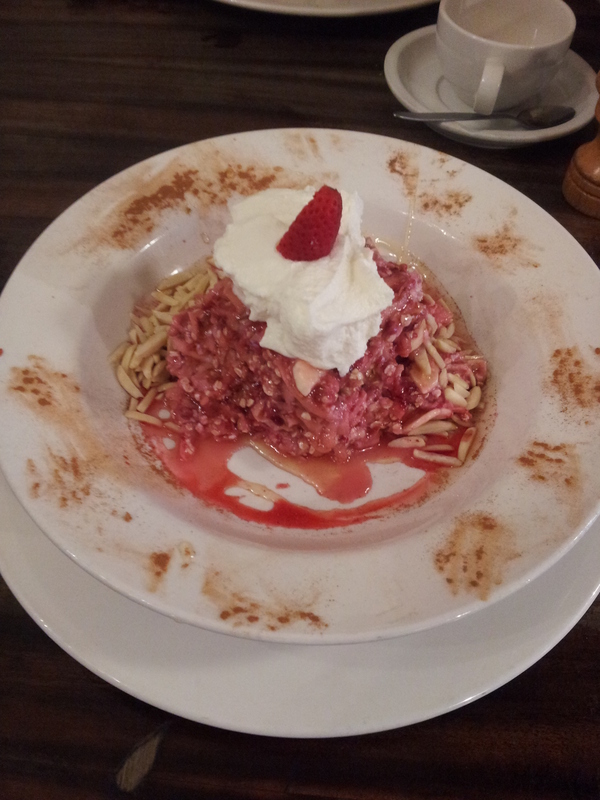 Café Lua: Halle-Lu(j)a(h) – Praise the Muesli! Capitalising on my moving out of home last week, I managed to wrangle a family (read: free) breakfast at the place of my choice – so long as it was in proximity to Melbourne University and RMIT so that Madame Phở-pas and Mr Scrambled Eggs (who ended up ordering a poached egg) could make it to their respective classes on time. I thus decided to pay a visit to Café Lua, home of the sprawling front on the South-East corner of Drummond and Elgin streets in Carlton. Café Lua is artsy. This could be due to the use of hessian sacks as wall art – or perhaps it was the art as wall art that tipped me off. Regardless, the décor is striking, especially the glorious chandelier hanging like a school of fish suspended mid-turn from the cavernous ceiling above the counter. A red feature wall further impresses the lusty, open charm of this place as does the fact that the popular café was teeming with many and varied human life-forms the closer it came to 9am. OK, perhaps I have gotten carried away with images of vitality here but Café Lua excited me in a way that makes me want to put on the accent of an English naturalist and narrate sweeping landscape shots of this place. Another thing to note is that the tables and chairs are of the retro linoleum veneer type that brings back memories of microwaved meals-on-wheels at Grandma’s house, and which seem to be in fashion at the moment. Presented in a bowl reminiscent of the eye in Egyptian artistry, this muesli defiantly stares back at the diner, daring to be eaten. Challenge accepted. On first bite it was instantly apparent that this was something to write home about. The cool, creamy tartness of the yoghurt was perfectly complimented by the sweet stewed pear. The toasted, flaked almonds added crunch and a smokiness that infused each mouthful with happy memories of cakes, biscuits and Christmas ham – without the overt sweetness or roasted meat-ness of any of those things. 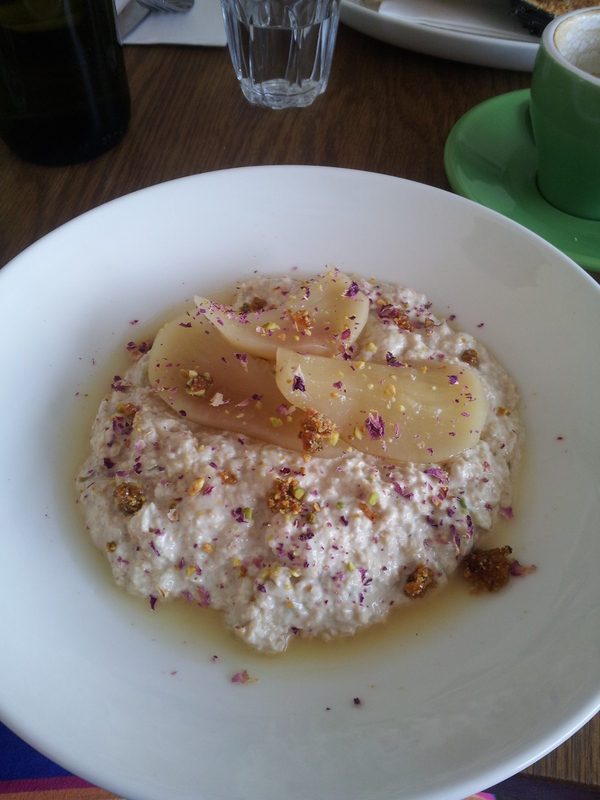 Another wonderful inclusion in this breakfast were sunflower seeds, and lots of them, giving an earthy added crunch. I’ve mentioned in a previous post my fondness for the cheerful, giant sunflower – well it turns out I love to eat them (or at least their seed) as well as look at them. Finally, and I will admit that it took a ‘mother’s taste’ on the part of Lady Grey to identify what exactly it was that I was sensing, cinnamon was used in the Café Lua muesli. Yes, it is nothing new that cinnamon and pear are wonderful together, but what a revelation to associate this with my oats and yoghurt! The pleasure of the cinnamon aftertaste at breakfast is not something that one forgets. For Cafe Lua the highest level of praise however was that, after much fumbling, Madam Phở-pas managed to eat this muesli with a fork and recognized its deliciousness despite hating cereal. 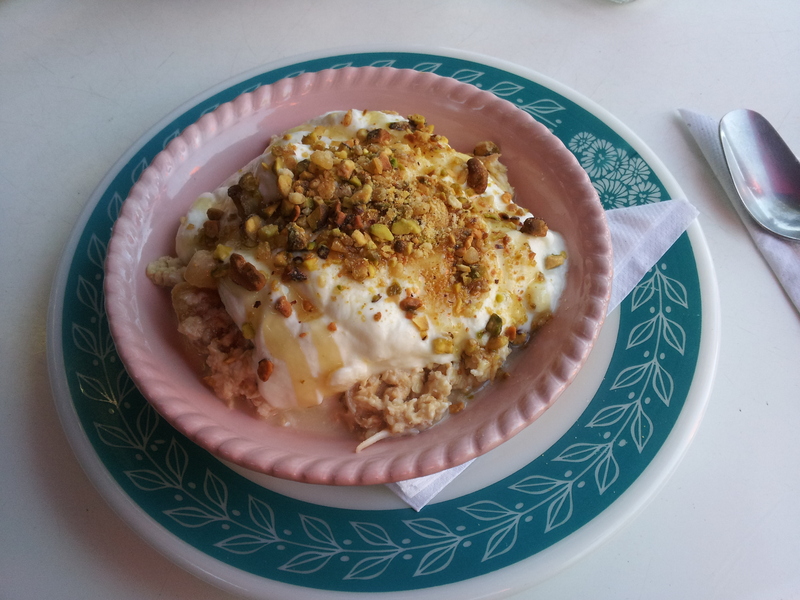 Overall: This was glorious muesli, the best that I have encountered to date. 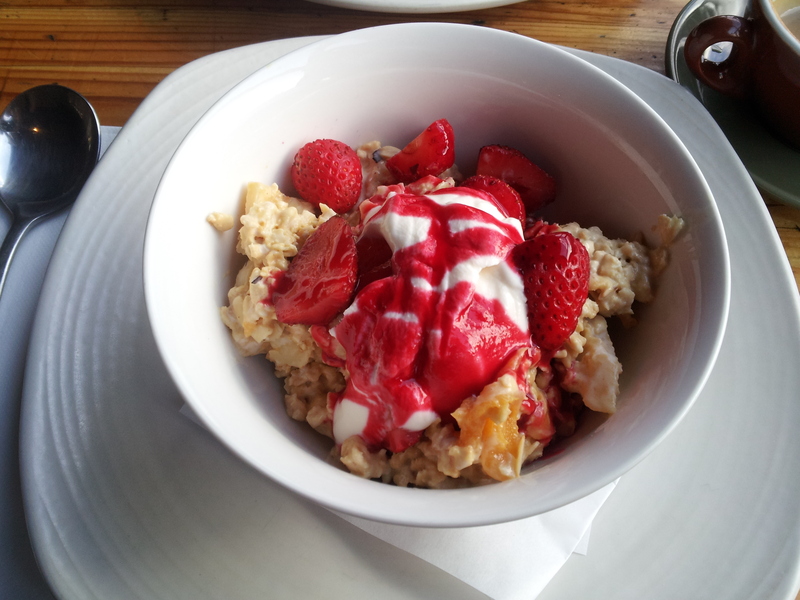 Go to Café Lua and politely demand to eat this muesli! The combination of the words pearl and oyster to create Pearl Oyster upsets my brain. I want to like it; I own pearls, have eaten an oyster and love all things sea-related (except sea snakes, those are awful) however being made to consider “Pearl Oyster” as a name puts me on edge. Is the oyster made of pearl? Is this a pearl-bearing oyster? Am I obsessing over something trivial? Regardless, I’m not looking forward to having to write this cafe’s name out repeatedly here. Very early last Saturday morning I managed to move beyond my name hang-ups and visit Pearl Oyster, located on Miller Street just East of Gilbert Road. The modest exterior belies an extensive indoor and out-door dining area that is very dedicated to a theme. That theme is Grandma-Cool. To give the place credit I felt instantly at home, with the decor effectively embodying the coastal old-folksiness of my childhood – minus the old lady musk (not unfortunately). The indoor space was decked out in Vs – vinyl, veneer and vintage – and while some may sneer at the pretentiousness of it all, I’m the sort to get excited about this level of commitment. It’s commitment like this that makes people good at karaoke, and wins Nobel prizes – Pearl Oyster’s achievement fits somewhere in the middle of that spectrum. Being a lovely Autumn morning my company and I elected to sit outdoors where we found an umbrella-shaded table with plastic chairs, on fake grass. The grandma-teaparty theme extends even to the outdoors! The icing on this visual cake came in the form of a crop of very cheery sunflowers that reminded me how much I enjoy bright, giant flora. I forgot to check if they were real and to be honest I’m glad I did not indulge my inner cynic – I choose to believe that they were living. What’s this? The visual pizzaz of berries has been shunned for a more homely nut exhibition. Pistachios were the guests of honour in this dish, a welcome addition to the standard company of nuts – almonds and hazelnuts (how blasé I have become, it was not three weeks ago that I was gushing over hazelnuts. Move over guys, there’s a new favourite in town). 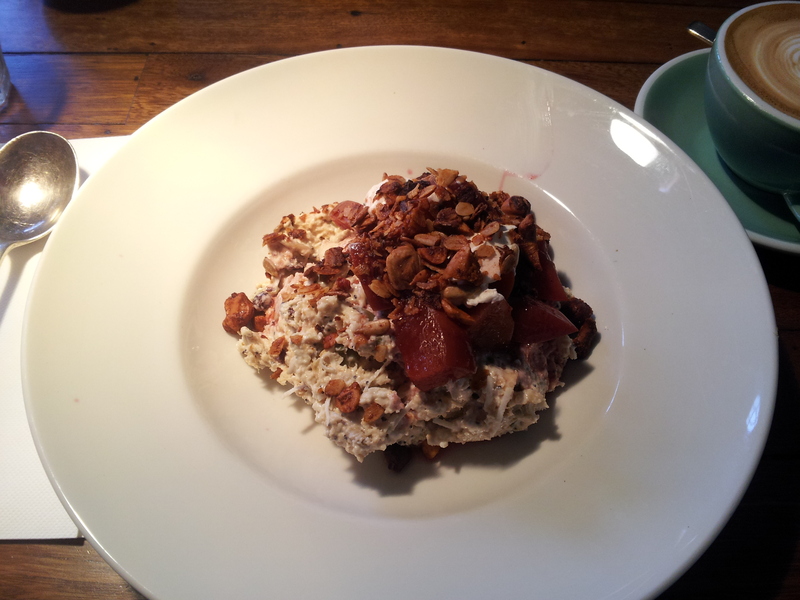 The prominence of nuts in this muesli was enjoyable in both taste and texture. This was a pretty light muesli otherwise in that the oats were not super concentrated nor was the yoghurt particularly thick. I noticed a pale, white liquid within this dish and came to the conclusion that it was either yoghurt juice, or that a small amount of milk had been added. The latter option is a dangerous one as the amount of milk added to a Bircher muesli is a very individual decision and can spell disaster if you overdo it (bitter, bitter experience talking here). Pearl Oyster got it right, though! Also if it was just a fluke of yoghurt juice perfectly loosening up the muesli, this would be the first time I have ever happily enjoyed what is without a doubt the worst part of yoghurt on a meal. 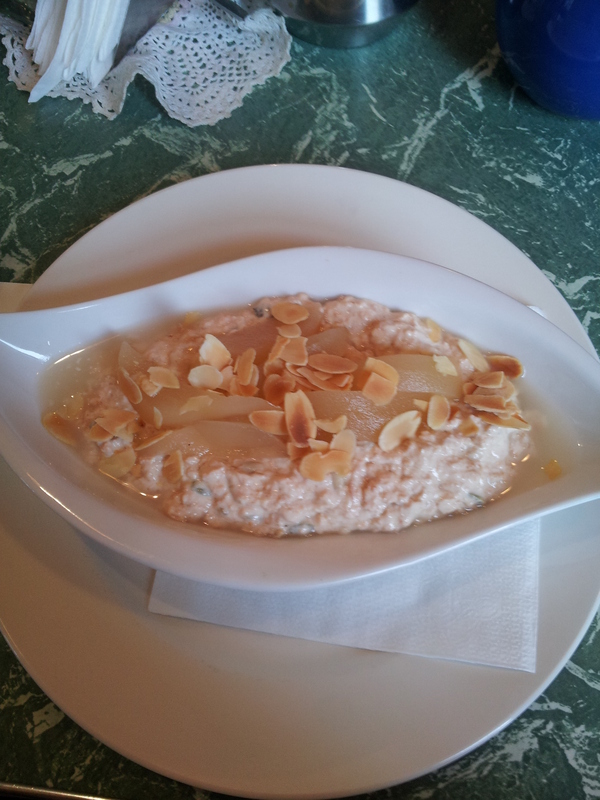 There were two other ingredients of note in the Pearl Oyster muesli, the first being figs. Figs! What a nice surprise. The other represents the only failing of the cafe theme – Granny Smith apples did not appear to be used, rather the red tinge to some of the grated apple suggested the employ of a Pink Lady. I much prefer pink lady apples, but they probably contributed (with the help of delicious coconut, apricot and honey) to this muesli being pretty sweet. As my father says, however: “there are plenty more teeth in the sea”, so the sweetness of this breakfast did not weigh too heavily on my mind. Final Words: Buy this muesli if you are craving nuts and want a sweet treat for breakfast, but also still want to be kept regular with fibre and dried fruits. 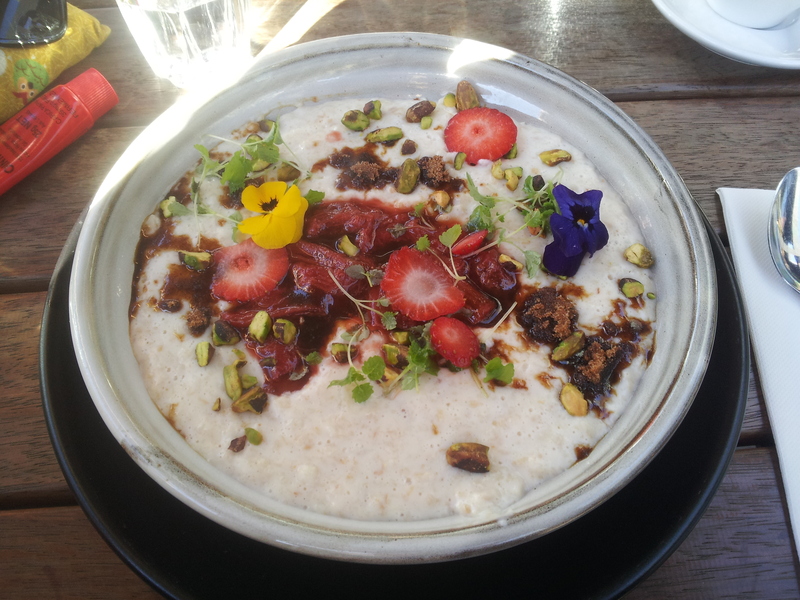 I was lucky enough to be having breakfast during work hours for this outing to Dr Dax Kitchen, a cafe that proudly protrudes like the frontal lobe of a higher primate from the entrance of the Melbourne Brain Centre on Royal Parade. I have (not that) often traipsed over to Dr Dax for coffee on days where I felt that I should treat myself to something nicer than a 7-Eleven $1 special or Zouki’s, but had not really ventured into their solid consumables for lack of time and opportunity. Here was my chance. Dr Dax is, fondly, nerd central. At all hours of the day people in suits and glasses can be found doing whatever it is they do when they are not at work; which is often working on a laptop, discussing work or waiting for coffee to take back to work. It is a busy place, but I do enjoy the atmosphere. The large westward-facing windows peer over the bustle of Royal Parade to the Royal Melbourne Hospital and further add to the urgent buzz of a place in constant flux. I am yet to visit Dr Dax in weather that would allow me to take advantage of sitting at the tables outside, but I imagine that might be quite nice so long as there are not too many lit cigarettes about. Now I’m not a psychiatrist but I suspect this muesli has an identity disorder. Here we have a case of fruit salad-on-muesli, the first of which I have come across. 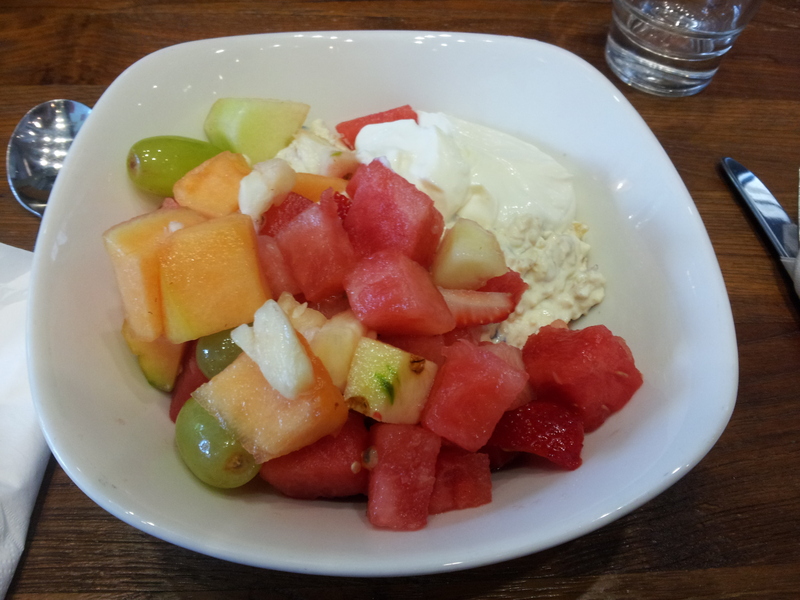 To its credit, the fruit salad was fresh and I will never hate on watermelon except to say that it and the rest of the fruit were grossly out of place in this meal. Sorry, watermelon. Basically, there was no attempt at fruit-muesli integration and I doubt even an intense course of cognitive behavioural therapy could make this dish coherent (I’m enjoying barely working in these psychological allusions far too much). I took a deep breath and moved past the fruit to the muesli, which might have been in the company of two types of yoghurt but I’m not discerning enough to confidently identify them. In fact now I think of it there just might have been an extra dollop of standard yoghurt on top of that which housed the oats. Anyway, another surprise occurred, this time mainly picked up by cranial nerves IX and X as my tongue and palate came to grips with the sheer density of oats that I had just delivered them. Yes, Dr Dax is guilty of handing out oats as if they were anti-depressants. My mood, however, did not improve – especially when I realised that this so-called Bircher muesli did not contain detectable grated apple or nuts! Unfortunately, my enjoyment of this breakfast was based mainly on the quality of the company I was with. 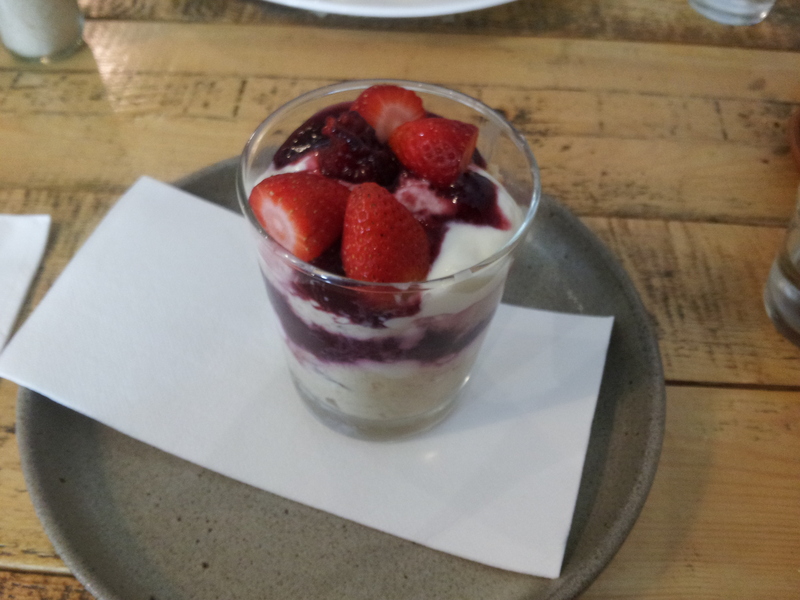 And so I had a lovely meal despite the muesli being sub-par. At least it was cold. Diagnosis: Schizoid-fruit-and-oats disorder with the main issue of it having a delusion of being Bircher muesli. My management of this poor entity would include the regrettable decision to reserve my money to be spent on cases with more hope. The coffee is good, though!